Draft layout of Fairview development of 5, 22-storey buildings with ground floor retail. The Molinaro Group has made a number of modifications to their proposed redevelopment of vacant lands on Fairview between the Walmart and GO station, in response to public input from an Oct. 25 design workshop. The scale of the project was determined by an Ontario Municipal Board (OMB) ruling and includes no limit on the number of units, and 17 storeys in height with an additional 3 storeys permitted if LEED certification (Leadership in Energy and Environmental Design) is achieved. The builder will be working toward LEED standards. The design, layout and other amenities of the project were open for input by the public, and formed the basis of the October design workshop. architecture that is modern with a mix of brick, glass and stone. Residents also asked for a turnlane on Fairview into the project. The street is already six lanes wide in front of the development, as a result of road improvements to accommodate the Walmart. Residents also raised concerns about traffic, sun shadowing and privacy concerns. The developer did a sun shadow study indicating that there will be no shadows on properties whose backyards face the south side of Fairview. Further, an angular plane study was conducted showing that views from the top floors will not extend past sidewalk on the opposite side of the street.Though a traffic study was not required by the OMB, a traffic study was done and is being reviewed by city staff. 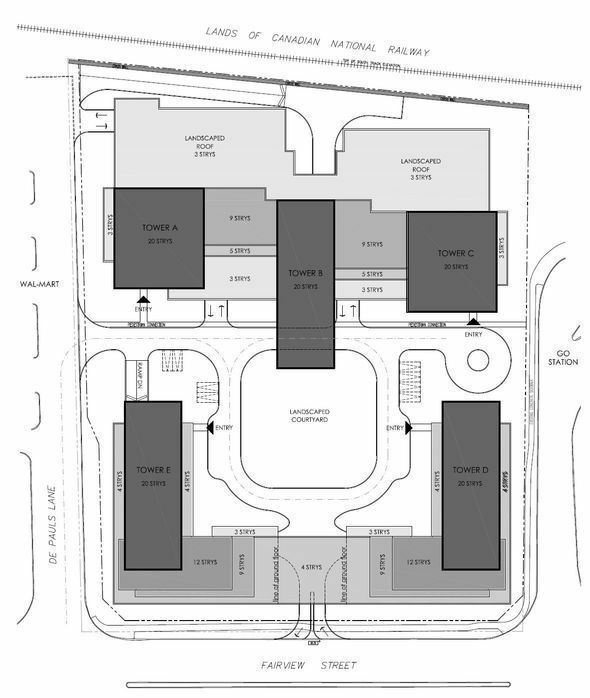 It will be posted online once the site plan is filed. The Molinaro Group hopes to submit a site plan to the city in early December. The final project will need approval from the OMB. Construction is expected to start in the fall of 2013. For the full list of changes, as well as the PowerPoint presentation showing the sun shadows, angular plane, background to the project and next steps, contact my assistant Georgie Gartside at georgie.gartside@burlington.ca. My Take: Though the scale of the project is significant, it is preferable to for height and density to be located on major roads near transit, rather than in interior neighbourhoods. Since the height and density for the project were determined by the OMB, my focus was to ensure public input on the things we could influence, namely the site plan matters. This is the first time that residents have been consulted on a site plan before it was filed. I thank staff and the developer for working with residents to get input, and hope to see more of this collaboration in future. Your feedback made the project better. Your thoughts: How would you make the site plan for this project better? Let me know by commenting below or email me at meedwardm@burlington.ca.